Construction work for the new oil and gas terminal at Takoradi port in Ghana, which is part of the ambitious port expansion project, is expected to commence in June 2014. According to the Director of the port, Captain James Owusu Koranteng, work on the new oil and gas terminal is progressing steadily and chances are the construction will be completed ahead of schedule. A Parliamentary Select Committee on Roads and Transport visited the site last week and it was satisfied with the work done so far. At present the Port which is the Ghana’s oldest seaport, does about 30% imports and 70% exports of cargoes that are considered to be of less value. Ghana Ports and Harbor’s Authority viewed the opportunity of the oil and gas found in 2007 and the subsequent exploration of the resource as a fine opportunity to get the once vibrant port, back on its feet and make it the services hub for the black gold industry. Ghana Oil Company (GOIL), Viking and Haliburton, have erected facilities to provide oil and gas services at the port. Due to the economic growth and the oil discoveries, existing port facilities are pressurised to accommodate the increase in traffic, especially in supply vessels that ply between the port and the oil fields. According to the GPHA, total traffic at the Takoradi port rose by 32 % to 5.3mn metric tonnes in 2012. 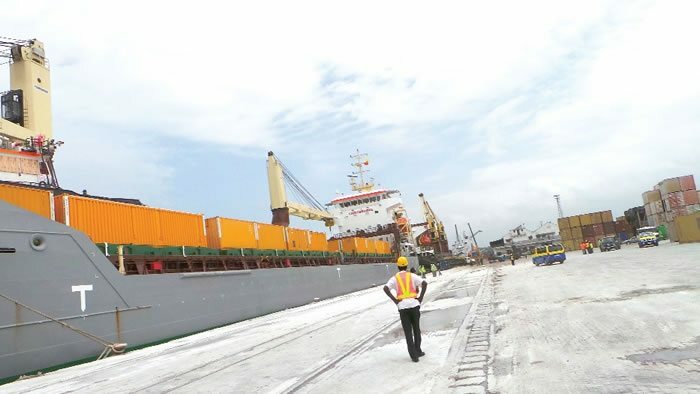 Earlier in 2013, the Ghana Ports and Habours Authority (GPHA) had appointed China Habour Engineering Company to complete the first phase of the expansion of the Takoradi port. This included the extension of the main breakwater by 1.5km northward, provision of facilities to handle bulk commodities, dredging of access channels and reclamation of land area of 53,000 hectares. In late 2013 Belgian engineering firm Jan De Nul Group (DJN) commenced the next phase of expansion of the port in Ghana, in an effort to transform it into a logistics hub in West Africa. The first and second phases of the expansion have been estimated to cost US$344m. The project, which was inaugurated by Ghana President John Dramani Mahama, has been scheduled for completion in 2016.